Critic proof: that’s my two-word assessment of Fluffy, Fluffy Cinnamoroll, a new all-ages manga starring one of Sanrio’s lesser-known characters. The story is a mixture of sincere sentiment and calculated product placement that’s been carefully designed to appeal to the under-ten crowd; an adult can practically hear the cha-ching of the cash register every time a new character or magical object is introduced. Volume one features a dozen or so stories involving picnics, treasure maps, trips to the beach, and letters to Santa Claus. Though there’s a strong element of fantasy in the gang’s adventures, there’s an even stronger whiff of didacticism: in one chapter, for example, Cinnamoroll must set aside his fear of the dark to rescue his friends, who are being held captive in a haunted house, while in another, Cinnamoroll learns to embrace the fact he’s different from the other “cloud kids.” Every conflict is neatly resolved in a few pages, with Cinnamoroll learning an important lesson about friendship, loyalty, or selflessness; only Cavity, a dark cloud with a devil’s tail, seems impervious to the other characters’ warmth and energy. As an adult reader, it’s impossible not to feel a little jaded reading Fluffy, Fluffy Cinnamoroll. The stories have predictable scripts that have been carefully designed to stimulate the reader’s awwwww reflex at regular intervals. The artwork, too, lacks personality; though no one would deny its fundamental cuteness, the art looks prefabricated, as if each character had been assembled from interchangeable parts from the Sanrio plant. More puzzling still is that none of the pups look particularly canine; the artist could easily have described all of them as long-eared rabbits without compromising the story. 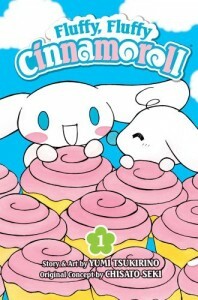 Yet for all the cynicism a project like Fluffy, Fluffy Cinnamoroll might inspire, I also understand its appeal: it looks like someone took the contents of my childhood sticker album and turned it into a story featuring puppies, unicorns, sweets, and rainbows. The stories, like the character designs, have a definite child logic to them, as the plots touch on a variety of pre-teen fantasies: being rich and famous, eating a diet of sweets, spending all your time playing with friends (no one goes to school), and learning that yes, indeed, you were born into the wrong family. If those stories aren’t executed with the grace or imagination of the best kids’ comics, they’ll still please the under-ten crowd with their whimsical settings and earnest characters. Just don’t be surprised when they ask the inevitable question: where can I get a Cinnamoroll doll?